The etiology of odontogenic keratocyst tumor (KCOT) consists of the remnants of dental lamina (Philipsen, 1956). 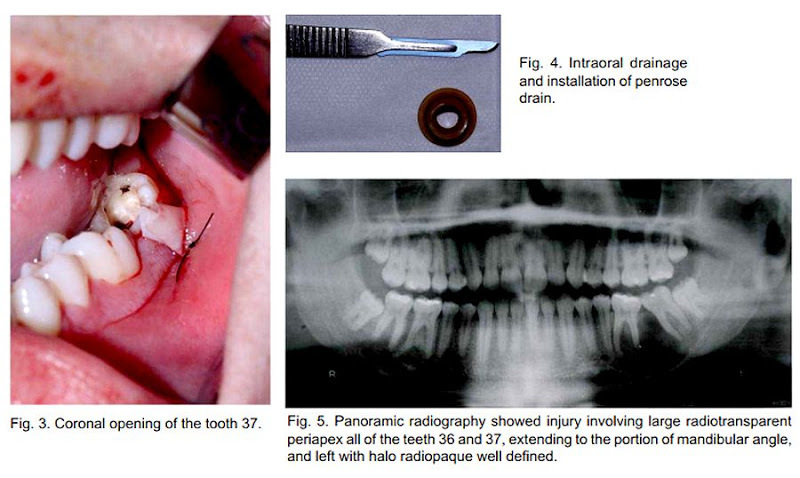 Matches 3 to 11% of odontogenic cysts (Brannon, 1976; Chuong et al., 1982). Recognized by WHO in 2005 as odontogenic keratocyst tumor, the lesion has an aggressive nature, with high recurrence rates, tumor characteristics, slow growth, does not cause metastasis and bone destruction generates (Barnes et al., 2005). Showed a predominance of males, and aged between 20 and 40 years (Kolokhytas et al., 2007). Clinically, KCOT characterized by a single lesion, with greater frequency in the region of branch location and angle of the jaw. It is generally asymptomatic, being discovered on routine radiographic examination. However, when it reaches major proportions, can display poor positioning of the teeth, swelling due to expansion of cortical spontaneous drainage of the cystic content in the oral cavity and also complaining of pain in cases of secondary infection of the lesion (Maurette et al., 2006).